Pantograph patterns cover the entire quilt top including borders. Beginning at .04 cents and up per square inch. The number of square inches in the quilt determines quilting charges. To determine the square inches (SI) in your quilt you will need to measure the Length_____multiplied by the Width____= SI____. To determine the cost of quilting you will multiply the SI by the fee for the chosen quilting. Example: 40" X 60" quilt size. 2400 square inches. Using average quilting pantograph, .02, multiplied by 2400 = cost of the quilting ..$48.00. Hand Binding: .25 cents per inch for hand stitched binding (machine stitched to front of quilt and then hand stitched to back of quilt). RUSH SERVICE: Rush orders $45.00. Not included in the quilting prices are: batting, backing, binding, pressing, seaming, etc. 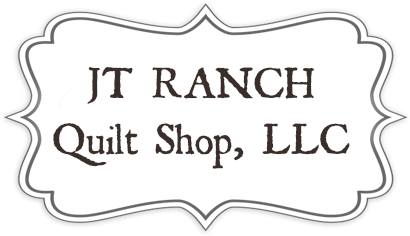 JT Ranch Quilt Shop, LLC is not responsible for folds in fabric due to fullness of piecing.